When this book landed on our desks, we were instantly intrigued. A history of fashion through the most iconic dresses? Sold. In The Hundred Dresses by Erin McKean, you’ll flip through the wardrobe of the ages from A to Z. Featuring funny, smart commentary and gorge illustrations by Donna Mehalko, each dress is brought to life. Moving quickly from the Xena, to the Wrap, to the Jackie, McKean teaches us all about each dress’ current popularity (or lack thereof), and when, where, and how it came to be. McKean illuminates the icons designers and their dress successes, and for each entry, she includes how-to-wear ideas for guaranteed sophisticated style. We love this ultimate guide to icons, designers and how their dresses changed and impacted society. 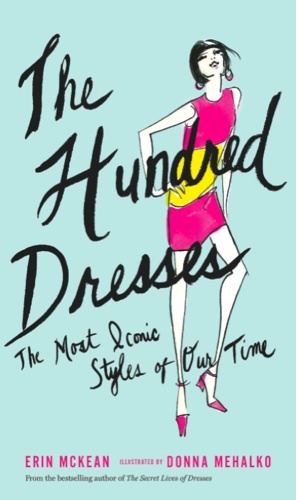 The Hundred Dresses is a fab (and fun!) way to learn all about fashion history.